I really wanted to read this novel before it’s release tomorrow, which is what happened even though I did nothing else this weekend. 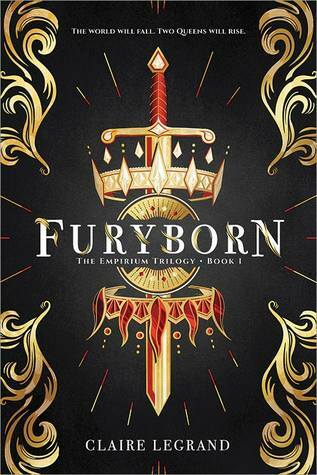 I give Furyborn by Claire Legrand four out of five hearts because it had a lot of potential, but didn’t live up to it. When I started this novel I only knew the story was about two girls, one a queen of light and the other a queen of blood, and that one would destroy the world and the other would save it. But as soon as I had read the prologue and the first two chapters I was confused as hell. If the prologue starts out in year 0, than chapter one is in year -2, but the start of chapter 2 says it is 1020 years later, how later? From chapter 1 or the prologue? Only several chapters later I could figure it out, which annoyed me a little. For most of the time I was confused and only by the last half could I connect the dots. I have no issues with things only becoming clear in the last half, but when you spend so long in confusion you can start to feel like throwing the novel away and just giving up. There is a lot of potential with these points, but because they were set up a little rickety, it doesn’t work that well. I thought the characters of Rielle and Eliana are pretty great. They both are very different and live a completely different life, which makes figuring out from which character you are reading in that moment very easy. Rielle has a secret love and is locked away by her father and teacher because she might explode and kill everyone around her. She hates her situation and tries to make the best of it together with the help of her two friends, Lu and Audric. Eliana is the Dread of Orline, a murderer of the Empire. Her reasons for choices are very clear and she knows it. I liked them a lot. The story ends with still quite a bunch of questions not answered but most of them are solved by the end. Knowing that this book is part of a series puts me into this annoying point where I like a first novel being rounded of and wanting the next novel because I want answers to those questions. I rather have a novel where all the questions are answered but there is a wish for more information on some background stuff or other things. Overall the novel is great, but it just doesn’t deliver on the hype it has been produced. If you want buy it and read it when the hype has died down a little more. Or when you don’t have to high hopes. I think I could have loved it I hadn’t been confused for a lot of the novel. This entry was posted in Book Review and tagged Adventure, Book Review, Claire Legrand, Drama, Fantasy, Mystery, Romance. Bookmark the permalink.